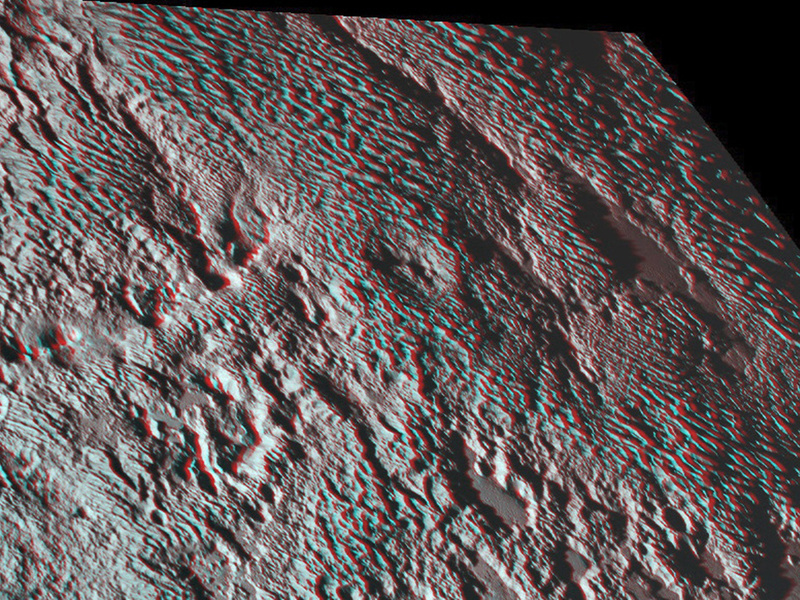 Grab your red and green 3-D spectacles to fully appreciate New Horizons’ view of the “bladed” terrain just east of Tombaugh Regio, the informal name given to Pluto’s large heart-shaped surface feature. Formally named Tartarus Dorsa, they align from north to south, reach hundreds of feet high and are typically spaced a few miles apart. Click the image for a full-size version. Image credits: NASA/JHUAPL/SwRI. One of the strangest landforms spotted by NASA’s New Horizons spacecraft when it flew past Pluto last July was the “bladed” terrain just east of Tombaugh Regio, the informal name given to Pluto’s large heart-shaped surface feature. No geology degree is necessary to see why the terrain is so interesting. Formally named Tartarus Dorsa, they align from north to south, reach hundreds of feet high and are typically spaced a few miles apart. This remarkable landform, unlike any other seen in our solar system, is perched on a much broader set of rounded ridges that are separated by flat valley floors. On the global image below, the bladed terrain extends far to the east. New Horizons scientists have speculated about (but not yet agreed on) the terrain’s origins. Current theories include erosion from evaporating ices or deposition of methane ices; New Horizons researcher Orkan Umurhan takes an in-depth look at the terrain — and proposes another origin idea — in this recent NASA Web blog. The amazing stereo view combines two images from the Ralph/Multispectral Visible Imaging Camera (MVIC) taken about 14 minutes apart on 14 July 2015. The first was taken when New Horizons was 16,000 miles (25,000 kilometres) away from Pluto, the second when the spacecraft was 10,000 miles (about 17,000 kilometres) away. Best resolution is approximately 1,000 feet (310 metres). This global view of Pluto combines a Ralph/Multispectral Visible Imaging Camera (MVIC) colour scan and an image from the Long Range Reconnaissance Imager (LORRI), both obtained on 13 July 2015 — the day before New Horizons’ closest approach. The MVIC scan was taken from a range of 1 million miles (1.6 million kilometres), at a resolution of 20 miles (32 kilometres) per pixel. The corresponding LORRI image was obtained from roughly the same range, but has a higher spatial resolution of 5 miles (8 kilometres) per pixel. 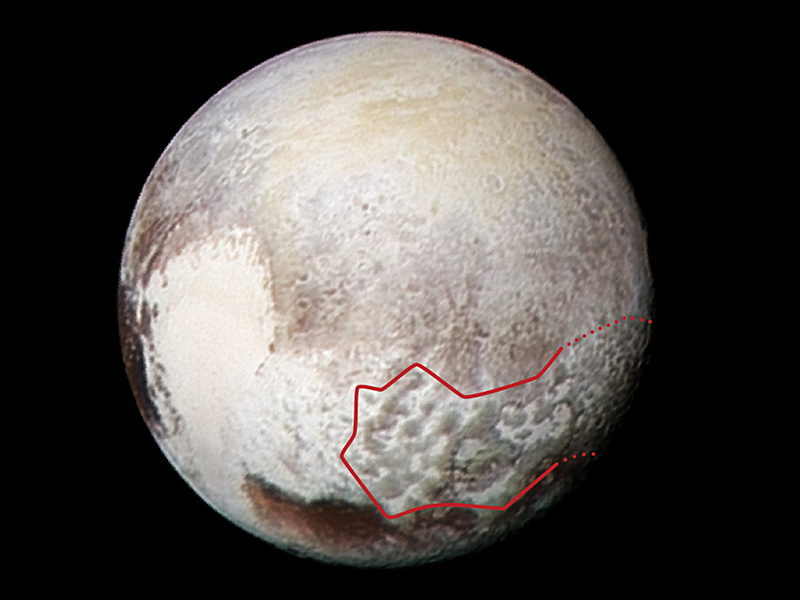 The red outline marks the large area of mysterious, bladed terrain extending from the eastern section of the large feature informally named Tombaugh Regio. 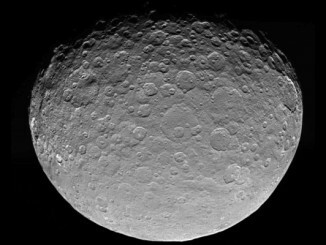 On May 8th, NASA’s Dawn spacecraft completed its mapping of the northern and southern hemisphere of dwarf planet Ceres in this orbit. The craft is now using its ion thruster to spiral down to the second mapping orbit. This image comes from May 4th. 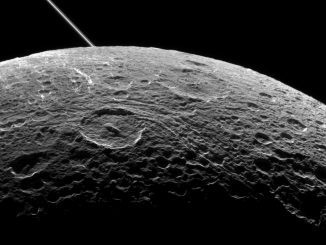 A subsurface ocean lies deep within Saturn’s moon Dione, according to new data from the Cassini mission. Two other moons of Saturn, Titan and Enceladus, are already known to hide global oceans beneath their icy crusts. Researchers believe that Dione’s crust floats on an ocean several tens of kilometres deep located 100 kilometres below the surface. 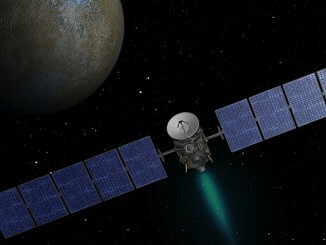 NASA’s Dawn spacecraft has begun its final approach to the dwarf planet Ceres, the largest object in the asteroid belt, for an in-depth survey of the uncharted world.